Brown University researchers have made a discovery about the way things stick together at tiny scales that could be helpful in engineering micro- and nanoscale devices. 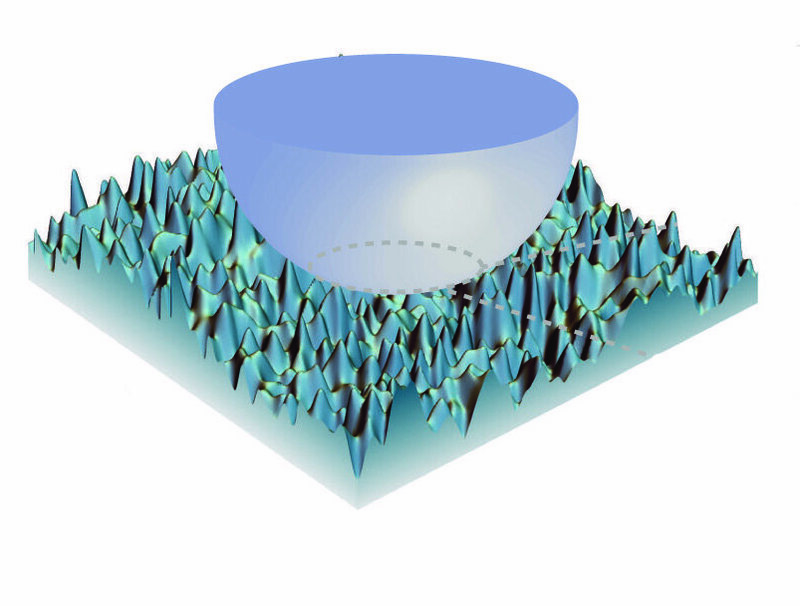 In a series of papers, the latest of which is published in Scientific Reports, the researchers show that miniscule differences in the roughness of a surface can cause surprising changes in the way two surfaces adhere to each other. Certain levels of roughness, the studies show, can cause the surfaces to exert different amounts of force on each other depending upon whether they're being pushed together or pulled apart. "People have worked on adhesion for over 100 years, but none of the existing theories captured this," said Weilin Deng, a Ph.D. student at Brown and the lead author of the study. "Over the course of this work, we showed with experiments that this really exists and now we have a theoretical framework that captures it." It's a subtle insight that could have important implications for nanoscale engineering, the researchers say. At very small scales, a family of adhesive forces called van der Waals forces dominate. So having a fuller understanding of how those forces work is critical. "At the sub-micron scales, the adhesive forces become dominant, while the force due to gravity is essentially meaningless by comparison," said Haneesh Kesari, an assistant professor in Brown's School of Engineering who oversaw the research. "That is why small insects like flies and ants can scale walls and ceilings with no problem. So from a practical perspective, if we want to engineer at those scales, we need a more complete theory of how adhesive forces deform and shape material surfaces, and coupled with surface roughness affect how surfaces stick to, and slip over one another." This line of research started a decade ago when Kesari was carrying out experiments to test adhesion at small scales. "These experiments were the most elementary way to study the problem," Kesari said. "We simply bring two solids together and pull them apart again while measuring the forces between the two surfaces." To do this at the micro-scale, Kesari used an atomic force microscope (AFM) apparatus. An AFM is a bit like a tiny record player. A cantilever with a small needle hanging from one end is dragged across a surface. By measuring how much the cantilever jiggles up and down, researchers can map out the physical features of a surface. For Kesari's experiments, he modified the setup slightly. He replaced the needle with a tiny glass bead and used the cantilever to simply raise and lower the bead—bringing it in contact with a substrate and then pulling it back off over and over again. The substrate was made of PDMS, a squishy polymer material often used in microscale engineered systems. The cantilever measured the forces that the two surfaces exerted on each other. The experiments showed that as the bead and the PDMS came close together or were just barely touching, there was an attractive force between the two. When the two were fully in contact and the cantilever continued to push down, the force flipped—the two solids were trying to push each other away. When the cantilever was raised again and the two solids moved apart, the attractive force returned until the gap was large enough for the force to disappear entirely. Those results weren't surprising. They were in line with how adhesion is usually thought to work. The surprising part was this: The amount of attractive force between the bead and PDMS substrate was different depending on whether the cantilever was on its way up or on its way down. "That was very surprising to me," Kesari said. "You have the exact same separation distance, but the forces are different when you're loading compared to unloading. There was nothing in the theoretical literature to explain it." Kesari performed the experiment in several slightly different ways to rule out confounding factors, like liquid-based suction between the two surfaces or some kind of tearing of the PDMS polymers. Having shown that the effect he detected wasn't an artifact of any known process, Kesari set out to figure out what was happening. The answer turned out to deal with surface roughness—miniscule amounts of roughness that would be insignificant in the same materials at larger scales or in stiffer materials at the same scales. Kesari and his students set about creating a mathematical model of how this roughness might affect adhesion. Overall, the theory predicts that interface toughness—the work required to separate two surfaces—increases steadily as roughness increases to a certain point. After that peak roughness point, the toughness drops off quickly. "This comprehensive theory helps to verify that what we were seeing in our experiments was real," Kesari said. "It's also now something that can be used in nanoscale engineering." For instance, he says, a full understanding of adhesion is helpful in designing micro-electro-mechanical systems—devices with micro- and nanoscale moving parts. Without properly accounting for how those tiny parts may stick and unstick, they may easily grind themselves to pieces. 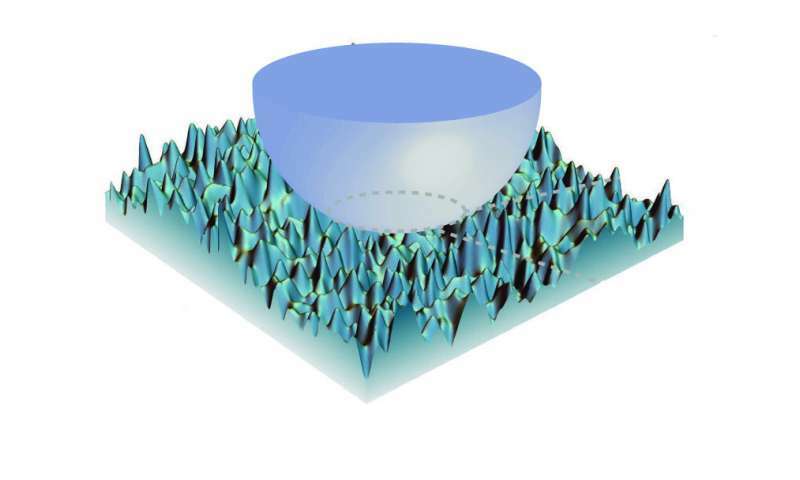 Another application could be using nanoscale patterning of surfaces. It might be possible to use nano-patterned surfaces to make solar panels that resist a build-up of dust, which robs them of their efficiency. "There's plenty we can do by engineering at the micro- and nanoscales," Kesari said. "But it will help if we have a better understanding of the physics that is important at those scales. Phys.org™ (formerly Physorg.com) is a leading web-based science, research and technology news service which covers a full range of topics. Phys.org is a part of Science X network. With global reach of over 5 million monthly readers and featuring dedicated websites for hard sciences, technology, smedical research and health news, the Science X network is one of the largest online communities for science-minded people. What do you think about this particular story? Your feedback will go directly to Science X editors. We would like to send you push notifications with news alerts?